Option #1. If you live in town and can make it to Wooden Spools every month you will come to the shop on the First Saturdays of the month (9:30 am) for 6 months. 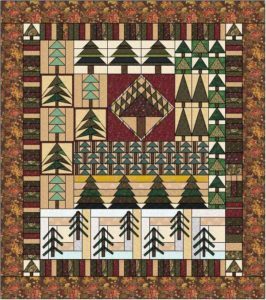 At the first gathering you will receive yardage lists for the entire project and instructions to make the center block of the quilt. On January 5th, Phyllis will teach a class on how to paper piece (Just $5.00) – and you can get your blocks for the first round made! Bring your machines and get started! The class will last till 1 – but you can stay and sew all day if you want! The 6th meet-up (June 1st) will be the final reveal, when we get to see everyone’s finished quilts!